The cancellation of a pay increase for private security guards has workers in malls, apartments and businesses across Manitoba worried the province could move to repeal labour rules that set their wages above the provincial minimum. 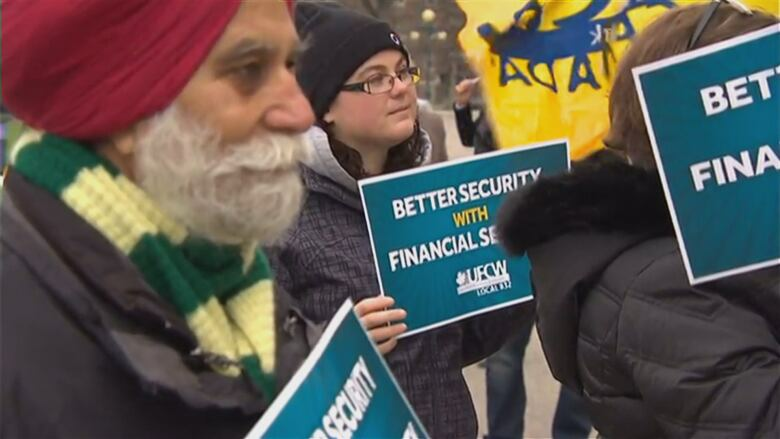 Security guards rallied on the steps of the legislative building Tuesday to protest after the province cancelled a $0.75 increase for guards that was supposed to go into effect on Oct. 1. "We have no idea who they're listening to because we have letters from employers who support this, the members support this, the public wants safer communities, so they support this," said Jeff Traeger, president of the United Food and Commercial Workers Local 832, which represents more than 1,700 security guards. In 2014, the province introduced new labour rules that laid out a schedule to raise the minimum wage for private security guards to $2.25 above the provincial minimum wage. The pay increases were to be spread out over four years, beginning in 2014 with a $0.25 increase, then $0.50 in 2015 and $0.75 in 2016. Another increase of $0.75 cents planned for this year hasn't happened, and there's now concern that the government is considering repealing the legislation altogether, Traeger said. "And we think that's absolutely wrong," he said. In a statement released on Tuesday, Growth, Enterprise and Trade Minister Blaine Pedersen said the wage increase has been "paused" while the Labour Management Review Committee considers "the question of maintaining a differential minimum wage for one sector." Guards are expected to put themselves in harm's way and use life-saving equipment, as well as be responsible for keeping people safe, including evacuating buildings, Traeger said. As part of the legislation, security guards are required to undergo a minimum of 40 hours of training when they start their jobs. "[The] combination of having that training, along with being able to afford to stay in the industry, means that they have extra experience, making everybody safer," Traeger said. "We're not asking for anything except a deal's a deal. Keep it, do it, and it makes sense to do it. And I also don't know why they wouldn't. "None of this money comes out of government coffers. This is a private-sector business so this isn't part of the budget or the deficit or anything like that." The cancelled pay increase would have brought the minimum wage for security guards to $13.40.